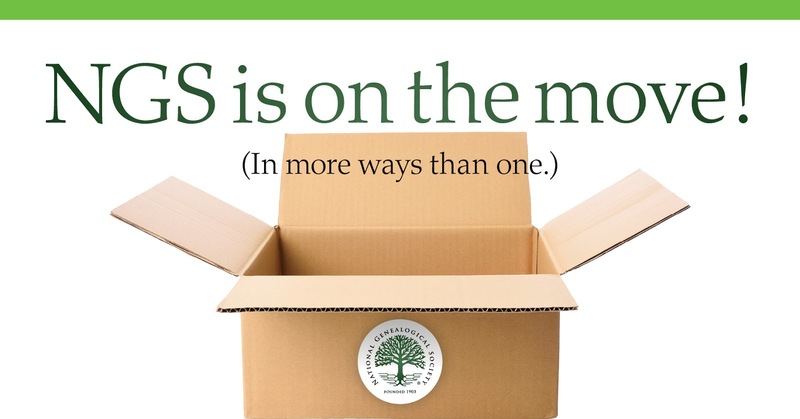 FALLS CHURCH, VA, 31 JANUARY 2018—The National Genealogical Society (NGS) moved to a new office in early January 2018. NGS didn’t go far, just five miles from Arlington to Falls Church, Virginia. The new space is smaller but technologically more up-to-date. The staff are still unpacking boxes and making sure the historical files are intact, so please have patience in the coming weeks as they complete all the tasks associated with moving an office. NGS is on the move in other ways too. It will be tackling another big project in the coming year, upgrading and updating its website. The new website will give members and the genealogical community fresh educational content to help everyone achieve their research goals and build strong and accurate family trees. Look for enhanced functionality, including a more robust search engine, new content, easier navigation, and improved integration. NGS also has new publications and online courses planned for 2018, as well as research trips, and a blockbuster family history conference in Grand Rapids, Michigan, from 2-5 May 2018. Make sure you update your contact lists with NGS’s new mailing address: 6400 Arlington Blvd., Suite 810, Falls Church, VA 22042-2318 USA. The telephone numbers remain the same. Tel. 703-525-0050 or 800-473-0060. Founded in 1903, the National Genealogical Society is dedicated to genealogical education, exemplary standards of research, and the preservation of genealogical records. The Falls Church, Virginia-based nonprofit is the premier national society for everyone, from the beginner to the most advanced family historian seeking excellence in publications, educational offerings, and guidance in research. It also offers many opportunities to interact with other genealogists. FALLS CHURCH, VA, 29 JANUARY 2018—The National Genealogical Society (NGS) has named Alison Hare, CG®, and Nancy A. Peters, CG, CGLSM, as co-editors of its National Genealogical Society Quarterly (NGSQ) beginning with the March 2019 issue. They take the reins of editorial responsibility for this prestigious publication from retiring editors Thomas W. Jones, PhD, CG, CGL, FASG, FNGS, FUGA, and Melinde Lutz Byrne, CG, FASG, who will continue as co-editors through the publication of the December 2018 issue. The October–December 2017 issue of NGS Magazine has been mailed to members and is available online in the Members Only section of the website. The theme is "Search Strategies." This issue focuses on strategies to locate unindexed, underindexed, and misindexed records, and on specialized indexes and search techniques that can bring hidden records into view. J. Mark Lowe examines indexing methods and the potential for errors. Understanding how an index was created can help researchers determine whether names should appear and develop workaround steps to find misindexed names. Five billion unindexed digital records are online at FamilySearch. Robert Raymond explains techniques for finding record sets and a systematic process to navigate to a specific image—essential knowledge since FamilySearch microfilm is no longer being distributed. Juliana Szucs reveals why some records on Ancestry aren’t searchable and details strategies for accessing them. Her tips for successfully using the site include searching collections individually, learning what facts are indexed for particular records, locating unindexed records, and working with available indexes. Dockets can be used as consolidated indexes for court records. Liz Stratton highlights the value of seven types of probate records and demonstrates how to find and use dockets on FamilySearch to locate all records for an estate. Jordan Jones suggests a methodology for Internet searches, recounts the foundation of Internet navigation and search, provides samples of search syntax, and presents a case study in which he narrows results of a Google search from fifty-­one million to seven. Claire Prechtel Kluskens guides users through the National Archives Catalog, a web-based tool for locating federal records useful for genealogical and historical research. The catalog contains seventy­-five million entries and thirty­-seven million images of records. Kathy Petlewski describes the evolution and uses of the sometimes overlooked but valuable Periodical Source Index (known as PERSI) and its two million entries indexing eight thousand periodicals from the United States, Canada, Great Britain, Australia, and Ireland. Wrapping up this issue, Theresa Fitzgerald discusses auxiliary records in the National Archives that provide information about World War I veterans, Fiona Fitzsimons continues her series on Irish religious records, and Diahan Southard portrays the ability of mitochondrial DNA to connect ancient and modern generations. 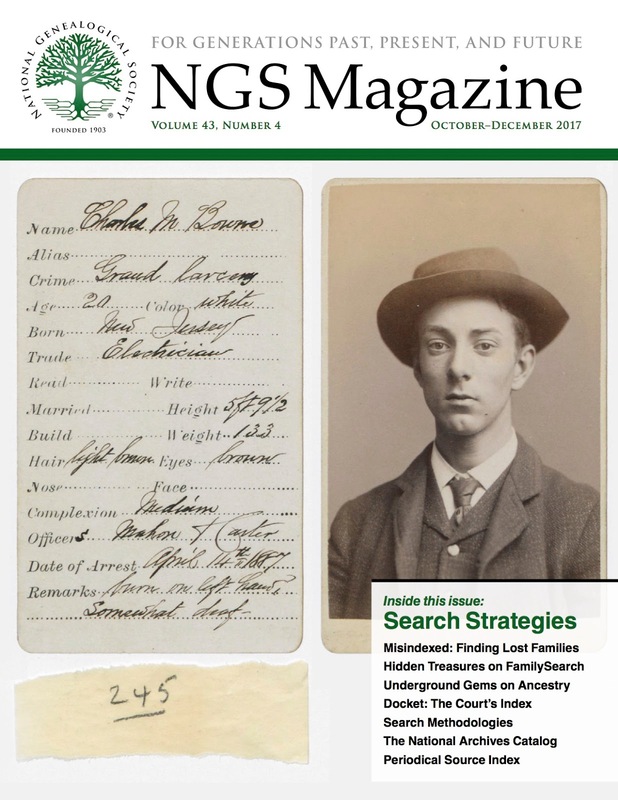 NGS Magazine is published quarterly to update members of the National Genealogical Society on NGS activities and to provide genealogists with special information and guidance on conducting effective genealogical research. The magazine is sent to libraries by subscription. Online access to NGS Magazine is available only as long as membership is active. ARLINGTON, VA, 2 JANUARY 2018—The National Genealogical Society (NGS) has opened the call for proposals for its 2019 Family History Conference, effective 2 January through 1 April 2018. The conference will be held in St. Charles, Missouri, from 8–11 May 2019. 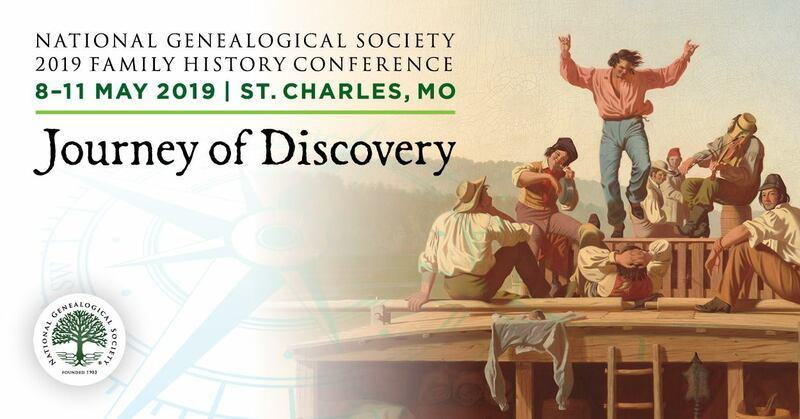 The conference program, Journey of Discovery, will focus on our ancestors’ records and the knowledge, skills, and tools family historians and genealogists need when they embark on a new journey of discovery with each family they research. Our American pioneers experienced their own journey of discovery as they migrated to the Louisiana Purchase and the Northwest Territory, thus opening the Midwest and Plains states to migration and new settlements. Over time, the rivers, trails west, and railroads were vital to this expansion. Bounty land warrants, the Homestead Act, and land grants provided many opportunities for settling the Midwest and points west. Native Americans, French fur traders, and Spanish soldiers preceded these settlers, discovering the beauty of the geysers, mountains, and plains much earlier. Migration from the east and south included Americans formerly from England, Ireland, Scotland, and Wales, often traveling with those enslaved or indentured. The end of the Civil War provided opportunities for African Americans to leave the plantations and travel north. The Germans and Irish as well as Eastern Europeans, all seeking new opportunities, poured into the country. They established new towns and cities, schools, and businesses, while maintaining their own customs and religions. NGS encourages proposals from individuals and organizations. Conference tracks under consideration will reflect the journey of discovery of America’s diverse ancestors and will include immigration, government documents, emigration, court records, ethnic resources, maps, migration, military records, religion, DNA, research methodology, technology, heirloom preservation, and some regional topics. 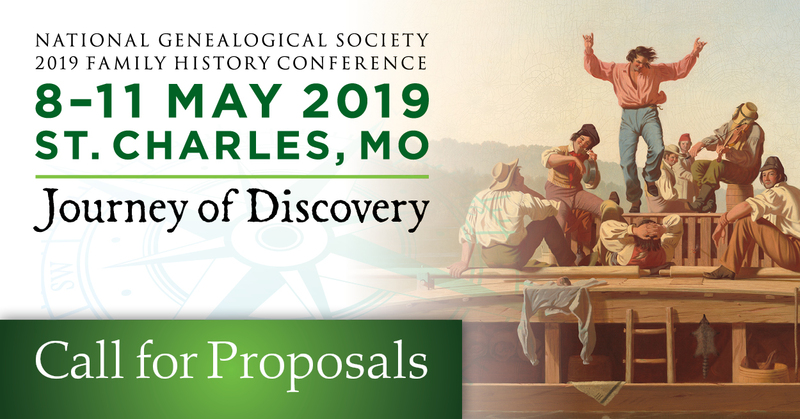 Speakers may submit up to eight proposals electronically via http://www.ngsgenealogy.org/cs/call_for_proposals. Genealogical and historical organizations are encouraged to sponsor a lecture and may submit proposals via http://www.ngsgenealogy.org/cs/call_for_proposals. For more information, visit http://www.ngsgenealogy.org/cs/call_for_proposals. All proposals must be submitted electronically by 11:59 p.m. EDT on 1 April 2018.